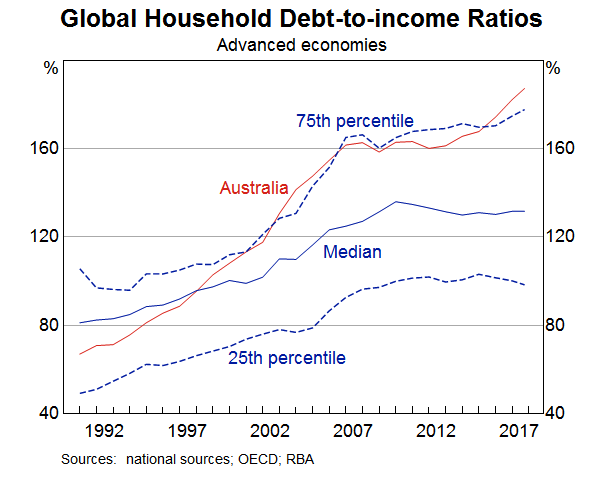 The risk that over indebted households pose to the outlook is something widely acknowledged by the RBA. In a speech yesterday the RBA sought to alleviate some fears around households risk by delving into how household balance sheets have evolved over time. Yesterday, Assistant Governor Michele Bullock delivered a speech titled ‘The Evolution of Household Sector Risks’. As is usually the case with detailed speeches from the RBA it was full of data and charts which generally provide valuable insight. 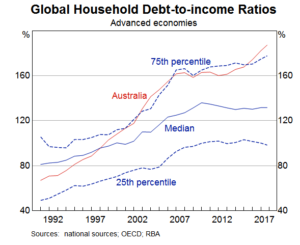 After highlighting the growth in household debt in Australia which has seen us rise towards the top of the pile when it comes to debt to income ratios, Bullock tried to downplay the risk posed by the elevated levels of debt. Despite acknowledging that there is a genuine risk that some households at the margin could be at risk, the conclusion was that on average, most households are in a position to meet potential challenges that lie ahead. There is a real risk that the negative feedback loop mentioned above could evolve in Australia. What is important to note is that the scenario above doesn’t take into account tightening lending standards, out of cycle rate hikes and the switch from interest only to principle and interest, all things that will add additional downside risk. The most important point is that it might not even take an adverse shock to trigger it. Continuing pressures and the steady decline in house prices could eventually lead to a tipping point that results in the negative feedback loop. While it isn’t part of their core outlook, the risk of a housing market downturn impacting household consumption is a greater risk than the RBA is current suggesting.